Does four pairs beat a royal flush? Ep.1: Does four pairs beat a royal flush? After scoring an incomplete grade for Ghost Island and missing out on writing about Survivor NZ 2 all together, I’m suffering major blogging withdrawals. So, I’m back – to put in another incomplete grade, but that’s life. I’m going to write as many columns as I’m able this season. So, what’s on the ticket this week? However, over on Australian Survivor, we have a similar theme going on. For those who aren’t watching, it’s called Champions vs Contenders. And as the season began, I felt the same way. I wanted to see the Contenders win. Their struggle was my struggle. I wanted to see them take the Champions down. And then something funny happened. A couple of the Champions were playing really strong games of Survivor. A couple of the Contenders were playing the game really badly, making bad mistakes strategically and socially at every turn – one of them I have even labelled as the second worst player of all time after Wendy Jo. And I found myself no longer rooting for people based on the label the game gave them, but based on how they were actually playing the game. I suspect something similar is going to happen here in this season. 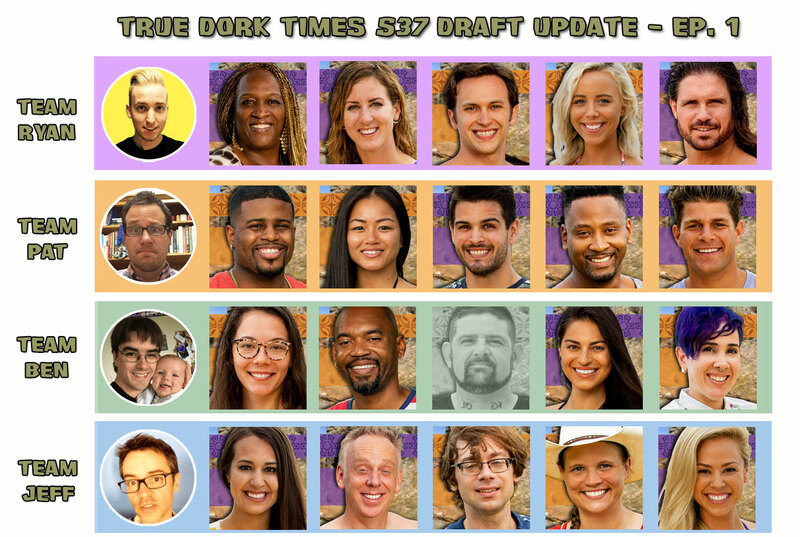 As it stands, the premiere has set us up to be rooting even more strongly for the David tribe than we were to begin with. And there’s no doubt that it would be a fun story to see the David tribe pick off the Goliaths and succeed as a team. But I dare say we’ll be in for an early swap and we’ll be in for some new Fijian tribe names shortly, and that will be the end of it. The theme is great for getting the players to act a certain way, and I think that’s the beauty of it. 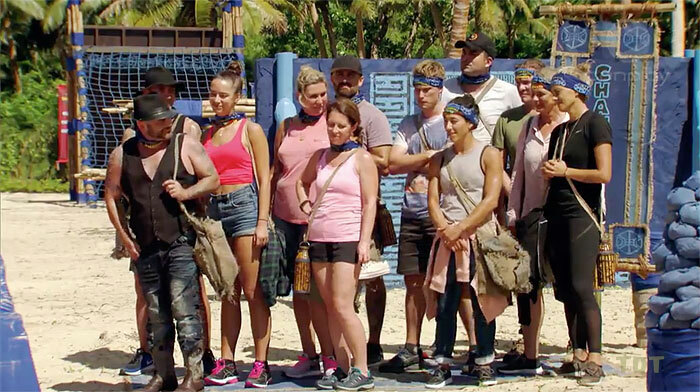 In Australian Survivor the Champions emphasised the importance of challenges because it was fed into their identity, while the Contenders acted like scrappy underdogs because it was fed into their identity. Here we see the players beginning to define themselves by way of the theme, and to me that’s the hallmark of a good season. If the production team can get players to actually change their own game plan to match the label that production give them, then they’re doing something right. In the end, if we see Goliaths acting like they are strong and intimidating and Davids acting as a community that has to work together to take Goliath down, I bet the end product will be compelling no matter which side comes out on top. And already I’m seeing some people in the Goliath tribe that I wouldn’t mind rooting for. I think the theme is off to a great start. This week was a good advertisement for having a 90 minute premiere with no tribal council every season. We got so much character development. What’s more, no single player dominated the run time, allowing you to get to know nearly everyone while leaving the field wide open in terms of who might be going to win. Unfortunately it feels like we would have lost 10 minutes of character development and probably what was so good about this premiere if it wasn’t for the fact there was no tribal council to show. Unfortunately, I don’t trust this to continue. Over the last few seasons, the editors have proven a little inept at telling complete stories within the 42 minute timeframe. Instead, the seasons have felt like they are being edited by different people with stories vanishing entirely, going nowhere, and being focussed entirely on two or three characters instead of a well-rounded look at the cast. While of course it would be nice to have 90 minutes every week (like Survivor NZ, who was able to use it for good more often than not), I recognise that CBS is never going to order Survivor this way to air. However, I feel like there is a big opportunity here. CBS should be putting an extended cut online – and they should be advertising it this way (of course, this should go on DVDs and other forms of distribution as well). Leave it to other markets to decide which version they want to buy. CBS have already been in the habit of putting up scores of secret scenes, but mostly they aren’t that interesting – just relatively unedited cuts of confessionals about reward challenges or other events that happen. But what if they edited in another 20 minutes of actual content about character and strategy? I think it would likely make the overall product significantly better, and would have a really good market. It would surely beat the existing approach to secret scenes. Unfortunately, as long as the 42 minute package is airing, that’s the go to for approaches such as Edgic. I dream of a world in which all characters are fleshed out enough that Edgic is extremely hard, where winners have flaws and losers appear viable winners until they lose. This week reminded me of how achievable that is, if only for one week. This could easily come crashing down this week, but one thing Survivor likes to do is set up meaningful pairs, and in the David tribe it apparently set up no fewer than four of them. We saw Jessica and Bi, Carl and Davie, Christian and Gabby, and Lyrsa and Elizabeth. I very much doubt all of David’s pairs can make it through to a merge situation. It’s not impossible, but it seems unlikely. The relationships on the David tribe were shown much more clearly than those on the Goliath tribe, which might simply be a result of the fact they lost immunity, but could also be because the relationships shown are (on the whole) more relevant to the plot in the near future. But given the effort it went to set them up, I wouldn’t be surprised if each of these pairs is either swapped together or makes it all the way through to the merge. Overall, while Goliath may have the Royal Flush of poker hands, I think the David tribe’s four pairs might just be the ticket it needs to come out on top. Here’s my prediction for the pairs. The relationship between Christian and Gabby is important. It’s going to be the basis on which at least one vote is decided. This could be as soon as next week. I could see this relationship being one of the most critical in the game; or even being a pair that does go all the way together. The relationship between Bi and Jessica is one of mentor/student. Bi is there to give Jessica what she needs to succeed and then stand aside. I wouldn’t be surprised if they’re together at the swap , but I don’t think Jessica will be able to rely on Bi much beyond that. She’s going to have to do the last stretch alone. Carl and Davie are just a natural pair who are going to have fun together and stay trusting each other. Perhaps they get to stay together in the next swap, but I wouldn’t be surprised if they’ll make the merge together as well. They aren’t going to betray each other but I don’t think it will be an important relationship to the game. One is likely to go without being blindsided by the other. Elizabeth and Lyrsa is the pair I fear the most for. I think it’s an interesting pair that deserves showcasing, and I hope it’s a sign that they’ll be together for a while, but we did see the target potentially shift to Lyrsa and we didn’t really see either of them making bonds with anyone else; next week will tell us far more. Perhaps Elizabeth will be the one to tell Lyrsa that her name is out there, and it could even end Elizabeth’s game if she does. This is the pair I feel will have the shortest run together. I’m taking a page out of Andy Baker’s book and looking at whose fortunes are falling and whose are rising. From where? Well, from an arbitrary neutralish starting point for these players, I suppose. Except it’s not really neutral, because I have some people coming in with really low expectations, and others with really high expectations so... really it’s just who I think had a good week and a bad week for their long term chances – and a couple where they had some kind of week, but I’m finding it a challenge to read. There are some whose fortunes seem entirely neutral on the strength of this episode, due to being par for the course – Natalie, Carl, Davie, Jeremy, Kara, Alison, and Elizabeth all seemed to do very little to change their starting position coming into the game in this episode. Of those, Natalie is the only one who seems actively in trouble, but she was always going to be. She could be gone next week, and no-one would be in the least surprised. All the rest got decent game-playing content and there’s nothing in what was shown that I think suggests any of them couldn’t go on to win. Here’s a quick Angelina supercut. “As I’m on this boat to start Survivor I look at everyone who’s on the boat around me and, I wondered is this my tribe. We just looked stacked. So much strength, so much beauty, some clear brains. And, as I look at the other tribe, I have the biggest smile on my face. The cards are just stacked completely in our favour and I want to take full advantage of that.” (This one said while looking at the David tribe with an ‘aww, they’re sooo adorable’ look on her face). 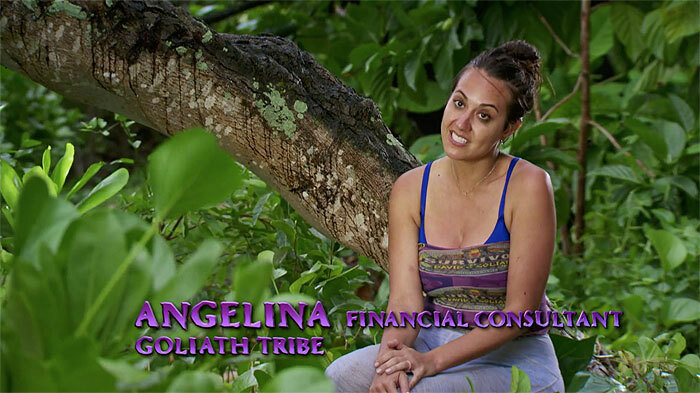 Credit to Sarah Channon on twitter, who pointed out this probably flags that a woman will find one (or a majority) of the idols this season – but in giving this confessional while we watched Alison looking instead of her, it also does nothing to suggest that that woman will be Angelina. These quotes are SOOOOOO arrogant, like she’s got the game won already, but lacking in awareness and actual strategy. Angelina is being built up as ripe for the fall, without being given any counterbalancing story. Even if a Goliath wins, it’s not going to be the Goliath who rubs being a Goliath in the face of the other tribe. Eight Davids are in pairs, and there are nine Davids. There’s only one David who appears in none of them at all. That’s Nick. And with Pat gone, the Davids look substantially weaker and more likely to return to tribal in the next episode unless the challenge suits their strengths. Nick was always likely to be a ruthless player, but I think that side of him was magnified by the fact he had difficulty opening up to others. Coming across as closed means coming across as cold, which means coming across as schemey for someone like Nick. It’s probably just introversion, but I think it deeply hurt his standing with the tribe. In addition, we have plenty of evidence that Nick would have gone home this week. Pat’s alliance seems pretty likely to have been real – Carl and Davie didn’t like Nick’s laziness, and we heard Lyrsa outright say ‘everyone’ was on board. While Pat wasn’t certain he had the sixth, this confessional shows he did. If Lyrsa brought in Elizabeth and Jess was bringing in Bi, then it’s not at all impossible Nick was going home in a 9-1 vote. There was nothing we saw on screen that would really lead us to believe Pat had the wrong read on the situation. But Nick does have one potential saving grace that might make sense of him getting to share his story in this episode... as I’ll note just a little bit later. So Dan found the idol and these three got decent collective screen time – surely I’d have him as ‘fortunes rising’, right? Not so fast. Dan should be situated in a great place in the game, and perhaps he even is, but the signs looked really bad. He’s busy trying to start a showmance when he knows it’s not the thing to do (and when we know it doesn’t work out), and they didn’t bother showing us anything about his apparent alliance with Natalia despite the fact she was with him when he found the idol. What’s more, Kara and Natalia both know about his idol and seem equipped to use that knowledge to their advantage. Dan got a narrative this episode, but I think the fact he got his hands on an idol meant he was always going to get a narrative – the show wants you to know the person with the idol. And nothing else about him was particularly flattering. Nineteen out of twenty players got good content that enabled us to know who they were in this episode. That’s a great strike rate. The outlier? Alec. He got one completely meaningless and unmemorable confessional and otherwise was virtually absent from the episode. Moments I notably saw him; using a spear to fail to catch a crab, open mouthed and blank while others shared their stories. Stood there asking ‘what should we do?’ and not doing any looking when Jeremy said to him that he wasn’t going to stand by while everyone else hunted for idols and walked into the jungle. When Bi was teaching Jessica how to weave fronds, Jessica got the personal content. When Jess and Bi traded stories about domestic violence, the focus was again on Jessica. Bi still got shown doing those things, and perhaps there’s nothing totally fatal about it. But if Bi was going to go on and win, wouldn’t it be more likely that she got a bit more of the focus in those moments than Jessica? Christian was also the guy who got to criticise Pat’s humour and bossiness in building the shelter; which Pat built well. You don’t want to be the person shown criticising the guy who is given incredible personal content about a challenging backstory at the start of the episode, and gets medevaced tragically at the end. All in all, just a bad week for Christian. But on the bright side, Christian is genuinely funny and he’s being given complexity as a character. I think he’s going to be around for a while. Sure, everyone was talking about how he was a big target. But it was only two minutes into the show where they showed a brief clip of him with a full beard with decent growth, and the day three immunity challenge showed that Mike isn’t going to be growing it overnight. It doesn’t prove he’s going to the merge, but he’s definitely around for a few episodes yet. (Davie and John were similarly shown with decent growth, but not significantly more than they’d already managed by the same challenge – and they had a head start). What’s more, the very early target on his back for idol hunting had to be all but gone after every single Goliath tribe member knew that every other Goliath member was idol hunting. It’s no longer taboo, and it’s going to be hard to paint Mike as worse for that reason. When the mass idol hunt happened, Goliath’s first target probably shifted from Mike to Natalie. John always had the potential to be a good player, but there was something else going for him this week. He got to expressly explain that he was not his wrestling character out here, and to set aside his character from his real persona. He’s playing Survivor as John, not as the Mayor of Slamtown. In addition, John was really reminding me of someone this week, and I realised it was Chris Daugherty. If he’s reminding me of a former Survivor winner, then that’s just another tick in his book. John could be the winner, but even if he’s not I think he’s going to be an interesting character who you’ll be able to root for. Maybe I’m seeing what I want to see here – I had to think long and hard about where to put Natalia and nearly put her in the next section. People are looking for her angry side because of the preseason, and it was there to be found if you watched carefully. But I think you had to want to see it. 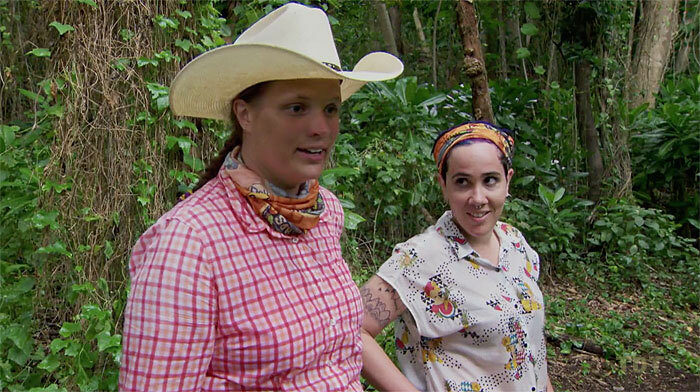 Natalia was shown as having the qualifications to build the shelter while Natalie didn’t, so was given the right side of that dispute; and what’s more she never got aggressive at Natalie and explained a rational position that was shown to be correct in confessionals. She was shown as being energetic, knowledgeable and positive when she suddenly appeared to note that Mike had been on The Amazing Race, and she was given distance from Dan and Kara despite clearly being in an alliance with them which I think might be a particularly good thing for her long term. What’s more, Natalia was shown as the one putting the target on both Natalie and Mike’s backs. With Natalie, she called her behaviour strange and unusual and said ‘it’s putting a target on her back’ – at which point, if the target wasn’t there already she was willing it into existence. When Mike was idol hunting, Natalia was the one to ask ‘are we just going to let him hunt for an idol?’ That’s canny play in that she could already be setting up both sides of a potential vote, and I think a lot of people are overlooking it already. Natalia’s fortunes may hinge on Natalie’s fortunes. If Natalie goes home next week, the show has set up Natalia this week to essentially get the credit for it and that’s a good starting point. If Natalie is still around going into a swap, then the story might be heading in a different direction. But for now, I feel very good about her spot in the game. Jessica gave me Baylor Wilson vibes to look at, and I felt like she would come across as super young and her lie would be false. But while Baylor got in the back seat while her mother did the driving, with Jessica it was the other way around. Jessica got to kick off the ‘personal content’ session that the David tribe had, and she did it with a story that gives her a maturity which could make her seem every bit her claimed age (and might even plausibly explain her ‘choice’ not to drink alcohol). Jess also was shown NOT getting in the shelter out of the rain when one of the boys said she could, reinforcing her as a true ‘David.’ Jess also got a heap of content in the wake of Pat’s medevac. So both in edit and in reality, I think the first three days went well better for Jessica than I expected them to. Not only that, but we saw her bonds with Carl, Bi and Gabby (and heard that she was in with Pat’s alliance) – in some ways she’s the only David we’ve seen who seems to be bridging the whole tribe well. On the strength of that one episode, I’d be surprised if she didn’t make the merge. In fact, she has to be one of the main contenders to be the winner right now. Gabby and Christian were not only shown as a pair, but they also got plenty of screen time both of them – and it seemed as though they were making other bonds as well. In reality it seems they were low on the tribe totem pole, so the fact that they were featured so heavily and so positively (and without a suggestion that either were excluded) suggests to me that we have a long term pair on our hands. While Christian was the one in his alliance talking about how abrasive Pat was, Gabby was the one who got to say she misjudged him at the end. We also got to hear Gabby talk about the fact that she translates geek into normal language. Side note: I could really use Gabby in my professional life. I’m not supposed to do technical ICT writing, but it’s what I spend a chunk of my time doing because frankly, people like Gabby usually can’t translate geek into normal language and when it comes to writing contracts, the techspeak won’t do the job. I think this is setting Gabby up well as a sort of go-between enabling alliances to hang together – what I predicted Dan might be before the season, but now I think Gabby might have the role. If she’s as good at it as she claims, then I’m pretty sure that with Gabby we’re either looking at the winner or the David Wright ‘too big a threat’ boot in the finale. With Gabby and Jessica both being in this section and being apparently a pair in reality, if not on the show – perhaps what we are heading for is that pair being more important than any we’ve actually seen as a pair yet. The only reason I can think for that is that they are not together for a good part of the pre-merge, and have to reconnect at the merge. 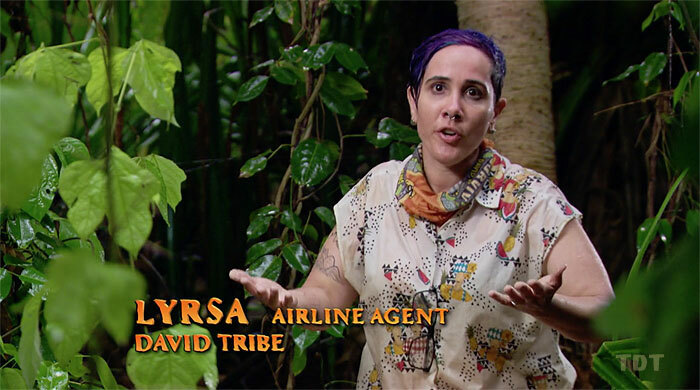 Lyrsa seemed to do a great job this week – she seemed like a fish out of water, but from everything we’ve learned she genuinely seemed to be in the majority. I want to have her in fortunes rising because she seems to be in a great spot. So why is the preview for next week talking about her name being thrown out there? I think it’s quite possible that the tribe doesn’t feel they can lose another strong guy right after losing Pat. With Pat there, Nick could have been an easy vote. With him gone, and if the David tribe loses another challenge, you could see them focusing on physical strength instead. They may feel they can’t lose Nick. And that would potentially mean they see Lyrsa as the most dispensable. Back to the bright side for Lyrsa though – when do the previews ever tell the truth? The very fact that she’s called out as a possible boot may mean, perhaps, that David somehow win the challenge? That doesn’t seem likely looking at the tribes, but it might be the boost she needs to make it through the week. So, for two seasons now I’ve been the first eliminated in the TDT draft, and this year didn’t start off any better. I had Pat on my team (although I had noted that I wasn’t that stoked to get him). But – to be fair – the person I wished I’d gotten instead was Dan, who Pat got just before me. And while I’d definitely be better off with Dan than Pat, I’m not really feeling like it’s going to make any odds right now. Dan isn’t going to be the guy to save my team. As for the rest of my team – Gabby, Carl, Natalia and Lyrsa – I don’t think it’s going too badly yet. Fingers crossed it stays that way. At the very least it would be nice just to not be first team out this year! ** Did anyone else notice the didgeridoo playing in the intro? It was the leadoff to the Australian Outback theme, unmistakably. I wasn’t complaining. I’m not quite sure how it fits the locale or theme, but David was a musician so... let’s go with that. ** Gabby is the “socially awkward” and Kara is the “naturally charming” as shown in the introduction. ** Nick got the chance to point out that “David became the King”. This is such an obvious part of David’s story that it was inevitable that it would be said by someone and included in the edit. While I am tempted so badly to see it as a sign that a David will win the game... surely that quote gets included either way, right? 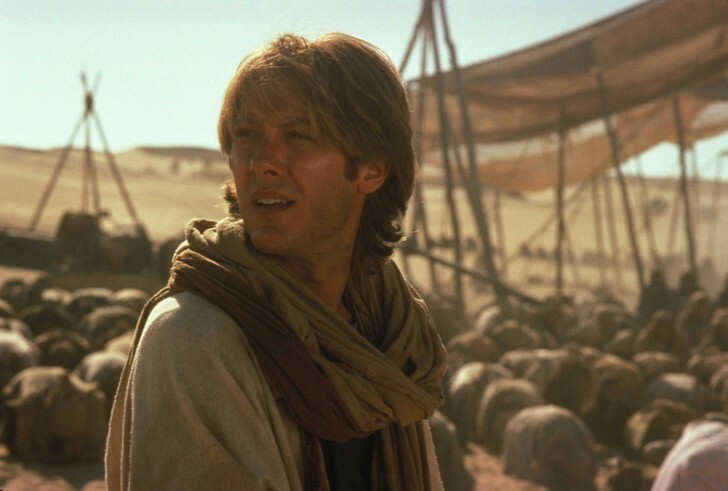 ** Christian looks like James Spader as Daniel Jackson in Stargate, no? He even acts a bit like him. Now that I’ve seen it, I can’t stop seeing it. ** Those pants they put Gabby in at the start. Really? Are they from an ABBA album cover? ** I felt as though the opening challenge was set up to be won and lost based on the decisions of the David tribe on first glance. That slide puzzle I had solved in my head within about 5 seconds of seeing it and it was also clear it could be done in seconds – it was the easiest slide puzzle possible. The 15 piece puzzle seemed impossible by comparison, and it was certainly much harder. However, on review, each side was painted a different colour while internal sides of pieces were unpainted. I think this puzzle could still have been done within a few minutes. That’s still a difference of a few minutes though, when challenges are usually won or lost by seconds; so, realistically, the David’s would have needed to be particularly bad at the first leg of the challenge and have fallen in the water a couple of times. I think it was definitely designed to be David leaning – so that the David’s would either get the great underdog story or look silly while losing. Either way, that’s a good story to be telling. ** First instinct on Natalie walking off and warning Mike that he’s putting a target on his back is that Natalie should want the target to be anyone but her. But in thinking it through, I think it was a good move. 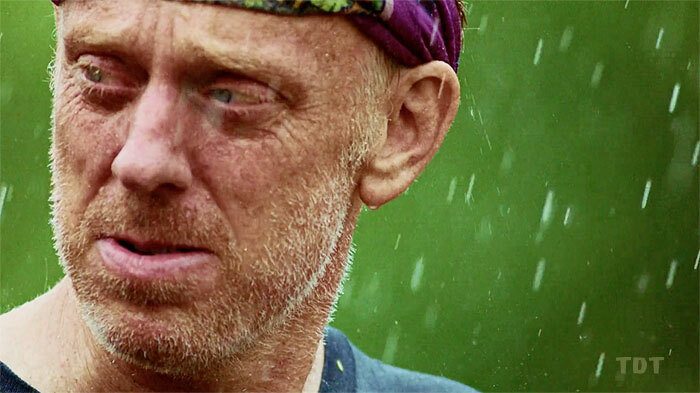 At this point in Survivor history, I think you should be planning on a swap at 18, and at that point the target on your back in the first 6 days can vanish, but doing Mike a good turn could subsist. Also, if she’s the person to come back to the group and confirm that’s what Mike was up to to others in private, it might have solidified relationships on that side as well. And how much more heat was Natalie really bringing onto herself with that move that wasn’t already there? ** Alison was the one saying they didn’t need to decide between Natalie and Mike just yet – which shows good mediation skills. She’s keeping that large alliance functional and making it clear that it could be either of them. ** Pat said that a little snake could pack in the most venom. Bi has a little snake tattooed on her right index finger. I don’t think there’s anything deliberate in that, but I like the symmetry. ** I’d like to see Pat return. I think he’d have made a good character; in fact he did in just the little amount of time he had. But I don’t think it’s likely he’ll win Survivor, even if he learns from watching this episode. Being himself will make him an early target, but being successfully social would leave him as an extremely big target. He just seems like one of those people that shouldn’t ever make it to the end – but then, that’s what I said about Ben Driebergen, so you just never know. ** A final prediction. Natalie drops her napalm next week on Kara, but it doesn’t work. Goliath (somehow) lose the challenge, saving Lyrsa in the process, and Natalie is voted out. And no Ryan, I really don’t want this to happen, even if it makes you dropping Gabby for me to draft all the sweeter. Natalie is great TV. But she couldn’t pull her head in and manage her leadership tendencies, and as a result I feel like her time is up sooner than later.